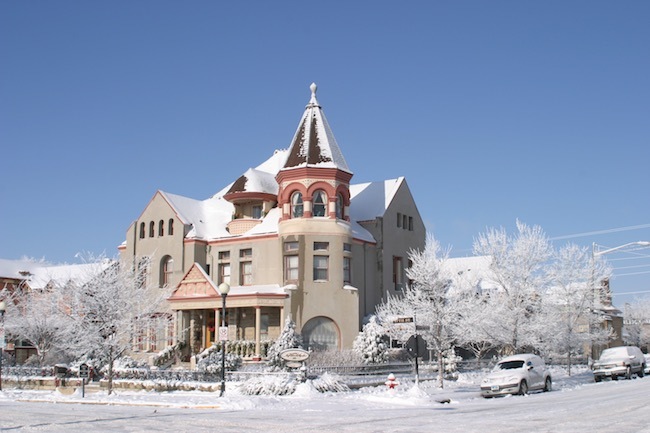 The historic Nagle Warren Mansion in Cheyenne, Wyoming is a lovely example of the city’s boom days in the late 1800s. 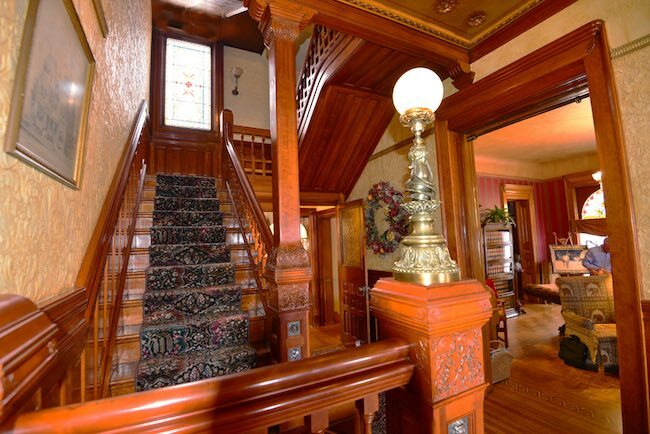 The exquisite home, now a Bed and Breakfast, is a throwback to the Victorian era and opulence of Wyoming’s Old West when cattle barons ruled and Cheyenne was the richest city in the world of cities of similar size. If you like taking a step back in time as I do, book a stay at this delightful destination. The mansion has somewhat of an incestuous lineage. It started in 1883 when Senator Francis E. Warren, the territory’s richest man and one of the most influential, built a large home next door to Cheyenne’s first all-brick house on 17th Street built by Erasmus Nagle, “The Merchant King of Wyoming.” Nagle declared his brick abode the “biggest and best house in Cheyenne.” So not to be outdone, in 1888 Nagle had his second grand mansion and carriage house built in the same block as Warren’s on the edge of Cattle Baron’s Row. Leftover stones unfit for the construction of the new Capitol were used for the home. Unfortunately, Nagle passed away after living in it with his family only two years. In 1910, none other than Senator Warren bought the mansion and moved in with his second wife. A sweet revenge, perhaps? Among the Warrens’ prestigious guests were Teddy Roosevelt and William Howard Taft. After Warren’s death, his widow Clara bequeathed the mansion to the YWCA as housing and gathering place for single women. During this time, those throwaway stones from the Capitol began to crumble, so in 1960 the exterior was covered in stucco. 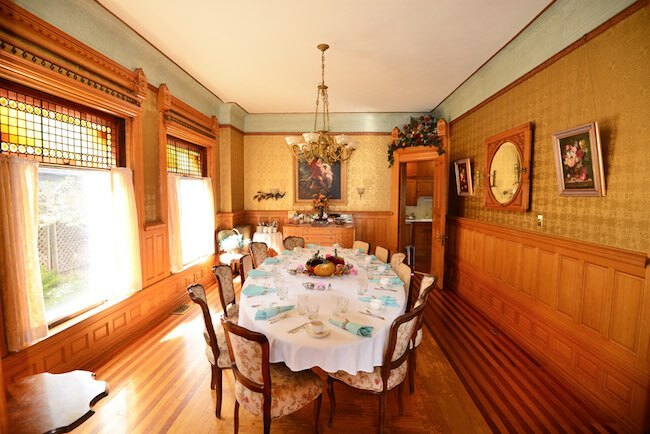 In 1985, the Sullivan family purchased the home; in 1997, hospitality veteran Jim Osterfoss bought the mansion and turned it into the elegant B&B that it is today. He’s preserved the home’s rich cherry, maple and oak woodwork, original chandeliers and stained glass. 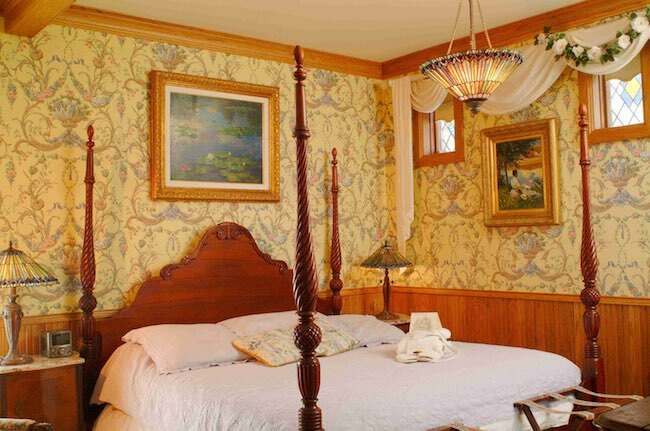 Each of the 12 rooms of the mansion and carriage house are individually decorated with period furniture and Victorian decor down to every little detail. We stayed in the spacious Francis E. Warren Room featuring three large bay windows carved out of the cupola tower. In front of the windows sits a desk with antique lamps, inkwell and other vintage curios. A king sleigh bed is surrounded by rich deep green and burgundy wallpaper. The adjoining bathroom includes a soaking tub and shower. You can view all rooms on the website. All are equipped with a desk, free WiFi, TV and phone. Small but thoughtful amenities include magnifying mirrors and LED lights for makeup, charging station for devices, iron/ironing board, clothing steamer, slippers/robes, posh towels, soft sheets and a back scratcher! There’s air conditioning but not an elevator. A staff person will help schlep luggage up the staircase if needed, and there is wheelchair access. Parking is free—on the street or in the lot across the street. There’s a business center, tastefully decorated meeting rooms with AV setups, a fitness center and hot tub. Children and pets are welcome with certain restrictions. Smoking is prohibited. 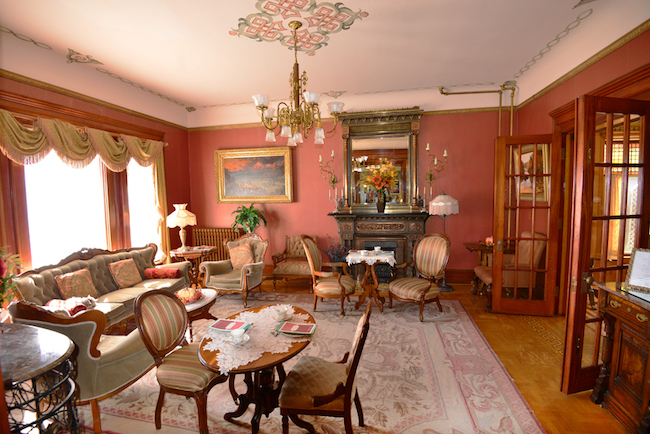 Common areas like the parlor are refined places to gather and socialize. A hearty hot breakfast is included in the price. We had fresh fruit, quiche, sausage, homemade breads and pastries elegantly served at a large table with other guests in the dining room. 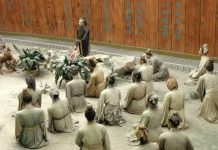 Lunch and dinner can be arranged for meetings and special events. 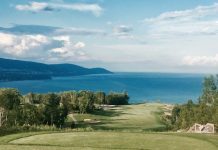 The mansion is ideal for an intimate wedding and reception for as many as 150, and their wedding planner can make it happen. Special dinners are scheduled periodically and seasonally, such as Murder Mystery, Fine Wine & Dine, Third Thursday Therapy and romantic dinner for two on Valentine’s Day. 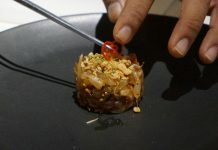 “We keep in mind our locale, history and today’s food trends,” the innkeeper writes on the website. Traditional tea is served every Friday and Saturday from 2 till 4 by staff in period clothes using fine English china and sparkling silver service, further immersing guests in the Victorian era. This is especially delightful during the holiday season when the mansion is dressed to the nines in old-fashioned festive decor. 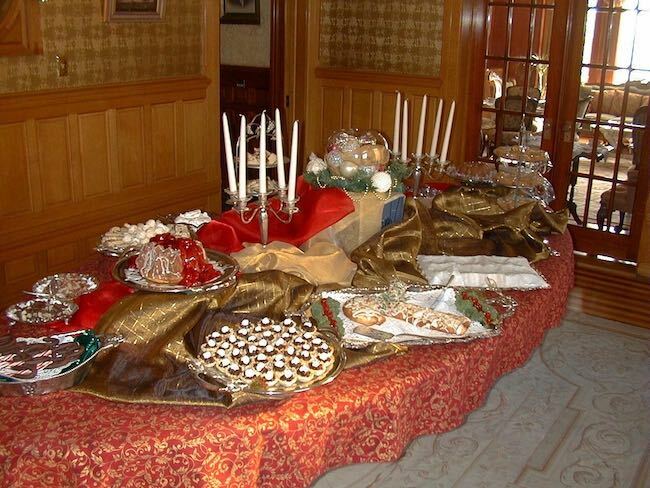 At Christmas, the Nagle Warren Mansion holds Christmas teas. The mansion is listed in the Smithsonian Guide to Historic America and National Register of Historic Places. Historic Governor’s Mansion offers free guided tours; at Christmas time, its unique “Tinsel Through Time” exhibit shows holiday decorations through the years in each room. Cheyenne Frontier Days celebrates western heritage for 10 action-packed days in July. Cheyenne Depot Museum features railroad history exhibits and hosts outdoor concerts in summer. Morris House Bistro is hands down Cheyenne’s best restaurant. Famous for its authentic low-country cuisine prepared by its southern-bred lawyer-chef and served in a charming historic home.